The 19th Century was marked by a renewed effort on the part of European nations to colonize various other parts of the world. The British would proclaim “The sun never sets on the British Empire,” and by the century, all but two countries in Africa would be considered colonial possessions. 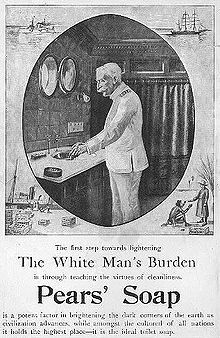 Imperialism in the late 19th Century required that Europeans be convinced that there was a moral reason for it. How do you think these advertisements contributed to that process? General instructions for the essay can be found on the first page. Read the sources that discuss imperialism, paying close attention to how they justify or criticize imperialism. Write a paper that either argues for or against empire, or, that argues that it is of benefit for some reasons and problematic for others. (In your thesis, be specific about your reasons). There are quite a few primary sources to choose from for this topic; for your essay, you must reference at least three primary sources in total as well as the secondary source.